The head collar also familiar as “Head Halters” looks like muzzles consist of two straps where goes around your dog’s nose and the other goes around the neck just behind the ears. The leash fastens the collar below the dog’s chin to a ring which is attached to the nose strap. These collars provide greater control and may cause your dog’s harm if you pull on them too hard. This type is more suitable for aggressive dogs to control in your own way. It may take some time to adjust the collar snugly but provide you with the highest output. At the beginning let your dog adjust with this collar and put it on them for short times. When the dog accustomed to wearing a head collar the risk of injury becomes decreases. It is the standard collar for your dog comes with a belt style buckle to attach on your dog’s neck. Usually, these are made of leather or nylon and arrived in a flat style. An identification tag is available in many collars which help to sort out your dog and control in your own way. Flat collars should not so tighten like choke collars or nor so loose that they can slip out. It should fit snugly on the dog’s neck so that you can get two fingers underneath the collar. Sometimes these offer the cheapest option with some safety concerns. 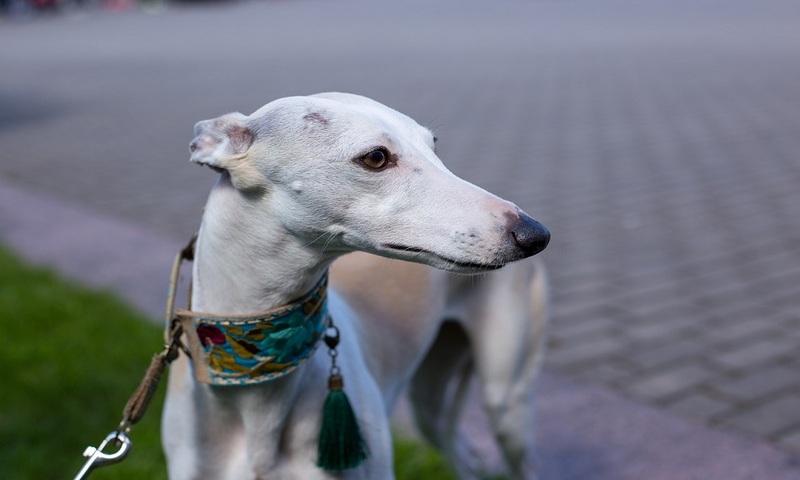 Martingale is familiar as an effective training collar, which is designed for dogs with narrow heads like Greyhounds Saluki, Whippets and Sighthounds. They provide more control over any breed that is adept at slipping out of their collar. These contain a loop of the chain which is connected to the solid band and goes around your dog’s neck. The main used material is strong nylon fabric and won’t cut the neck like a choke collar. These collars synch up a certain amount if the dog pulls and stop you from injuring your dog’s esophagus. They also consist of a length of material and metal ring with each end. There is not enough extra material may fall your dog in danger. The structure allows the collar to be fitted snugly to use in a similar manner like the choke chain. Leather collars are classic, comes in durable materials, different length, widths, colors and provide a great look with proper balance. Though leather collars can be plain in design and other decorations but have a smart and attractive appearance. They are cost-effective, durable and long lasting can be expected to last for years. Be sure while choosing the leather collar that is made from original leather. Some bonded leather looks and feel like genuine but won’t have a good quality and same durability like the real leather. These collars have a smaller variety of colors or patterns and can get stiff if get wet. These collars are the multipurpose standard collar ideal for dogs to wear around the house, on walks, and for attaching ID tags. They are almost similar to the leather collar and available in several choices of length and width. The durable plastic closure clips together and makes stronger and longer lasting. There are a huge variety of patterns, a wide range of colors, and qualities within this collar category. They are more adjustable than leather collars and can grow along with dogs. It is fairly inexpensive, lightweight and suitable for puppies. Nylon collars are machine washable and not easy to clean by free hand. This collar is made of metal links in different thickness and that has two rings at both ends. It can be shaped into a loop slips over the dog’s head and rest around the high up on the dog’s neck just behind the ears. When the leash of the collar is connected to the “dead ring” the collar doesn’t become tightened on the dog’s neck but when it is connected to the “live ring” the collar adjusts tightly. It is very low-priced and popular because after proper fit dogs can’t get out of them. It helps to correct a dog’s aggressive behavior but pulling harder the collar may press on the dog’s esophagus and cause of serious injury or even death to the dog. This collar should use when you are taking the dog on walks or simple outdoor activities. Also known as pinch collar, that has spikes and digs into the dog’s neck when pulled. Usually, it is recommended for large dogs that are stubborn pullers. This collar can be used for training dogs those are irresponsive to other collars. It should properly adjust the size by adding or removing prong links and sit top of the dog’s neck, just behind ears. The collar also should be fitted snugly so the prong links do not pinch into your dog’s trachea. You should use the prong collar especially when there is a need for a dog’s behavioral change. So, when you decide to use one, consult with a vet or an experienced trainer to get the proper knowledge on how to size, adjust and use it. Also called remote training collar designed to send a low intensive electric signal, tone, or vibration through the collar. Basically, shock collar used for remote communication and finally considered as a pet training tool to stop barking or control aggressive behavior. It is also used with pet containment system. A radio receiver is attached with the collar and a trainer holds the transmitter and sends the signal by triggering. Various types of the signal emitted from the collar and alert Dog owners can transmit different types of the signal according to the dog’s nature but electrical stimulation is most widely used. Sometimes the shock may painful for your pooch and compelled to abstain from aggressive behavior. Electronic dog fencing system also delivers a shock when the dog approaches to cross the designated boundary. So it should not use a shock collar without special purpose and some pet lovers hate to apply electric signals to their loving pets. Using a training collar is the best way to train a dog. It transmits electronic signals that teach stubborn dogs not to exhibit offensive behavior. Most of this collar looks same and comes in a small LCD screen, and a remote. So before using this collar, you must know how to operate it properly so that your dog doesn’t feel extreme pain after receiving signals. You should make sure the exact size of the collar which is the best suited on your dog’s neck. Along with dog’s neck size also ensure the weight and thickness of the collar which your dog can handle suitably. Always conduct a successful training session wherein your dog becomes more interested to attend the regular training session. When it comes to the electric dog collar, it implies a fantastic training tool which provides a lifetime solution to your pet to leave all ill-behaved manners. So, at first, choose the correct device which is best suited for your pet and then learn how to properly train with this collar. Consider about the durability of the device if you need for home, yard or park training. If your dog likes swimming then prefer a water-resistant model. Similarly, you have to think about the distance or range you want to cover by this collar. If you want to control your dog from a far distance then choose a longer range model. So, with that, due to select any electronic collar, focus on its size and proper adjustment so that the dog feels comfortable to wear. It comes in Global Positioning Satellite Technology to identify your pet’s location if they get lost. It is generally the most practical to pet proprietor keeps their dog secure enough in any environment. The technology offers a variety of approaches and it is easy to attach a GPS tracker to a collar as well as remove after using. When the pet leaves its safe zone, the GPS tracker sends a signal to your mobile app, which sends an alert to your phone. Via this mobile app, you can activate the live tracking and follow your pet’s location in real time. There are so many tracker brands available in the market and you can consult with your vet to choose the best one to get accurate tracking facilities. The dog flea collar is impregnated with either chemical pesticides or natural essential oils and helps your dog to protect against fleas and ticks. The used chemicals are organophosphates, amitraz or pyrethrins have the ability to kills fleas. Usually, the proper use of these chemicals couldn’t harm your dog but there are some inherent risks of them. So, if you have fear of toxic chemicals, you can pick various natural flea collars for your dog’s safety. There is a range of sizes and you should find out the correct size to fit properly. Be sure how adjustable the flea collar is, the slide buckle helps to adjust any size of the collar. Moreover, many flea collars offer protection from ticks also. The vibrating collar is the most effective tool of communication with your dog from far. At first, you need a high-quality collar to grow up necessary awareness about good manners and basic commands. There are various types of vibrating collars but all of them do not work in the same manner. Basically, it attaches via a rubber or fabric collar and connects with a buckle. Many of them can be used to trigger an audible tone or a static shock. Some pet trainers contend this collar to get only your dog’s attention rather than corrections. However, this type of collar is useful to train a deaf dog that is unable to hear your voice or other sounds. This type of collar is ideal for keeping track of your dog at night. Usually, it lights up with LED so that you can see the dog easily from a good distance. This lighted collar helps to guide when you walk your dog in the evening or in the dark night. It can keep the dog visible and safe in the darkness and allow for romping as well as fun at the night camping trip. The LED collar provides solid or flashing lights so that you can clearly observe your dog from far and other pedestrians can see when you are out for a walk. It also makes easy for drivers to see the dog and can go a long way to preventing dangers. Elizabethan collar sometimes called E-collar is a cone-shaped, wide, plastic collar used to prevent dogs from scratching wounds while they heal. Dogs become tarnished for irritating at injured areas. It is normal for them to bite, scratch, and lick the injured area. So, pet proprietor finds Elizabethan collar as the best solution with this recovery collar. The term recovery collar also comes from the standard term Elizabethan collar. It can be attached to your dog’s regular collar and keep them secure. There is a variety of sizes to ensure the snug fit regarding your dog’s size. Your dog can drink and eat regular food item with this collar and doesn’t injured for any reason. In this article, we have discussed some of the best dog collar types. After carefully reading this post, definitely you can make the idea on what you need for your dog. Just consider your pet’s needs, age, size, activity level and safety issues while finalizing a new collar. We hope, you will able to find the best suit when will do more research on different collar types.